The Three Rivers Rambler pictured still operates today with a steam locomotive pulling the train on a 90 minute excursion. 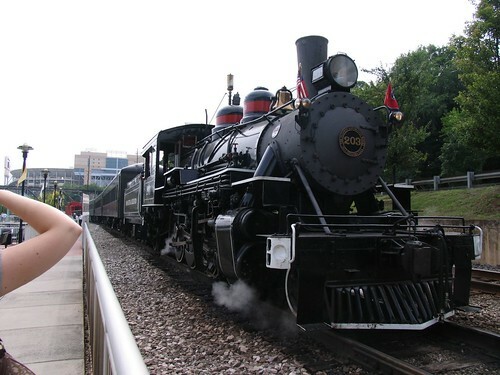 We have a local train called the Three Rivers Rambler located in Knoxville that takes riders on a 90 minute excursion as it makes a 11 mile trip through the area. It is good to see these locomotives still operating 97 years after the first commercially successful steam locomotives first ran in 1912. The first locomotive was built between 1780 and 1794 by John Fitch of the United States. It took about 130 years to perfect the technology enough for commercial use. The Three Rivers Rambler Christmas train filmed during the Christmas season of 2008. This clip features scenery from the Mount Rainier National Park area. This exciting technology lifts trains off the tracks after achieving top speed through magnetic levitation. It reaches top speed of 431 kilometers per hour which translates into 267 miles per hour. The Milwaukee Road had the fastest scheduled steam-powered passenger trains in the world. Both it and the Chicago & North Western had timetables requiring running in excess of 100 mph (160 km/h); it is believed that both railroads’ locomotives exceeded 120 mph (190 km/h). Technology may be advancing but I still prefer the old days when you could hear the lonesome whistle blowing across the trestle as depicted in the song Blues In The Night.